Nubia has launched the Limited Edition of Nubia Z17 mini with Snapdragon 653, 6GB RAM and 128GB storage version that comes in new Aurora Blue color. Nubia Z17 mini feature a 5.2-inch 1080p 2.5D curved glass display powered by an Octa-Core Snapdragon 653 processor with 6GB of RAM and 128GB of internal storage. has a unibody metal design.It has a dual 13-megapixel rear camera, one with monochrome lens and the other one with RGB lens, offering crisp shots. It has ultra fast focus in 0.1 seconds and supports aperture adjustment from f/1.0 to f/16.0. It also has a 16-megapixel front-facing camera with 80-degree wide-angle lens. Connectivity options include 4G VoLTE, Wi-Fi 802.11ac (2.4/5GHz), Bluetooth 4.1, GPS + GLONASS, NFC Packed with a 2950mAh battery with fast charging. The device runs on Nubia UI 4.0 based on Android 6.0 (Marshmallow) No details when Nougat will be available also there is Fingerprint Scanner on The Rear. 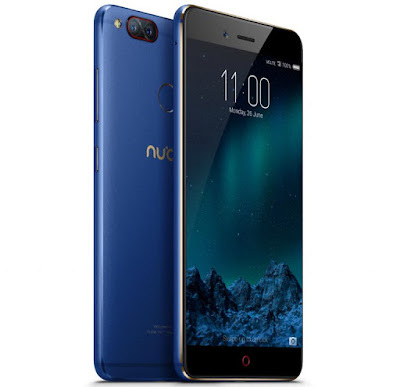 Nubia Z17 mini Limited Edtion is priced at Rs. 21,499 and available exclusively on Amazon.in.